Kick the winter blues with a pair of guilt-free shoes at Centre A’s Annual Shoe Party at John Fluevog’s beautiful Gastown location, while supporting public access to contemporary Asian art in Vancouver! 2018 Centre A Shoe Party: Community Partner Discount! Exclusive Community Partner Discount for Centre A Shoe Party (ONLY $20)! The only thing better than a great party is knowing that you're doing good while having fun. 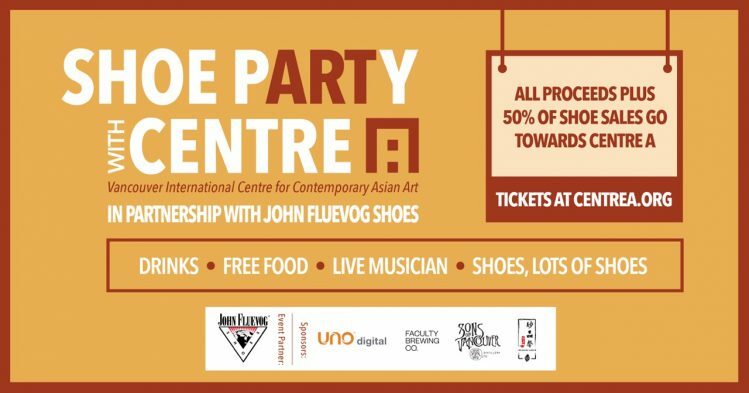 That's why Centre A is once again partnering with John Fluevog Shoes to throw a Shoe Party in style! You'll find tasty bites from local eateries. A cash bar featuring craft beer from Faculty Brewing, and two exclusive "signature tea cocktails" created for this event only -- courtesy of Treasure Green Tea Company and Sons of Vancouver Distillery. Live performances from a mystery guest. And shoes, lots of shoes. Enjoy John Fluevog's gorgeous Gastown space with some of the best company in town. Best of all -- 100% of all ticket and cash bar sales for the event, as well as 50% of all shoe sales will go directly towards Centre A's 2019 programming. With your Community Partner Discount you only have to pay $20 (regular $24) to support Centre A and attend our Shoe Party! And with this event only, you can sign up to be a Centre A member (regular $20) for 50% off! See option to purchase your discounted membership with your ticket below. Please select the number of tickets you would like to purchase. Please advise us of any allergies, dietary restrictions, accessibility needs, and additional guest's names and contact information. © 2018 Centre A. All Rights Reserved.